The three of us flew in on Friday: I came from Florida, Beth from North Carolina, and Stacy from Indiana. I arrived first, around 3:30 pm. Beth was scheduled to arrive at 7:30 pm and Stacy was scheduled to arrive at 8:30 pm. Due to storms out west that delayed the arriving flights into their airports, both Stacy’s and Beth’s flights were delayed. Beth was only delayed for an hour, but Stacy got delayed for 3 hours. Fortunately, she had her Hitchhiker Spinning wheel and a couple knitting projects with her, so she used her time to spin and knit. I wish I had a picture of her spinning in the airport. That’s definitely not something you see every day. Everyone was staring, and one airport employee told her it was the coolest thing she’d ever seen someone do while waiting for a flight. Our original plan was for Stacy and I to arrive at the fairgrounds around 7:30 am on Saturday, with Beth (in her own rental car) joining us later. But since Stacy’s flight delay meant we did not get to bed until 1:00 am, we elected to get a little more sleep. Stacy and I arrived at the fairgrounds around 9:30 am or so. 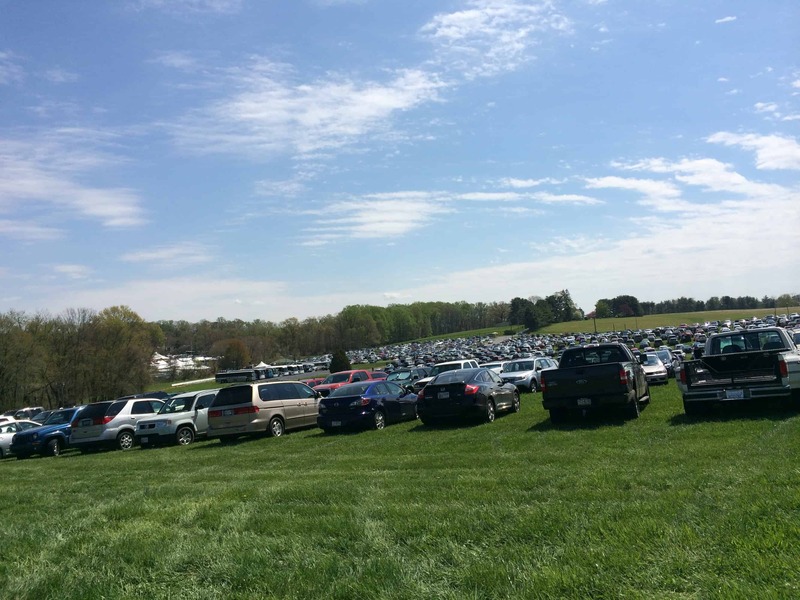 We were parked in the hinterlands, almost as far as you could be from the entrance and still be in the fairgrounds parking. It was a hike! The parking area is hilly, so I couldn’t get all of it in the pic. The sidewalk leading from the parking area into the festival is lined with a split rail fence and trees. 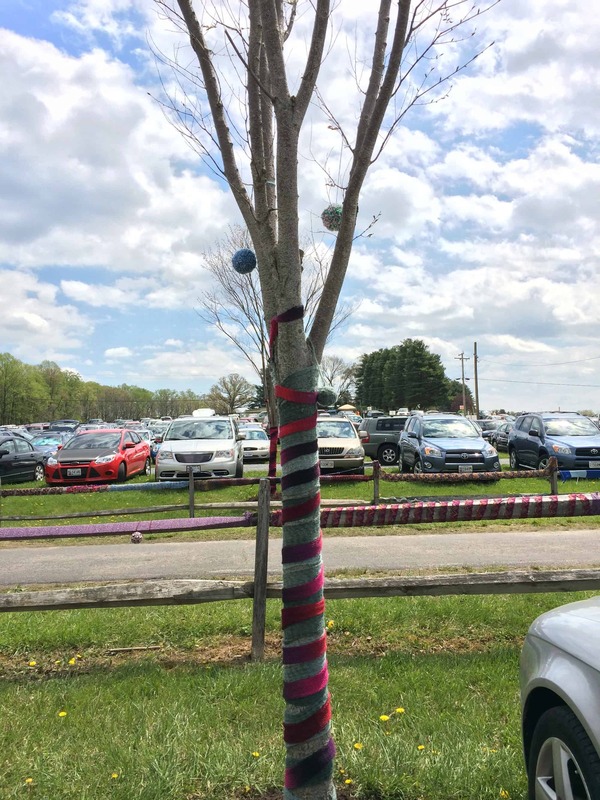 The fence and trees were all yarn bombed! We were in the right place! The main reason Stacy brought her Hitchhiker is because The Merlin Tree had a booth at MDSW and Dave, who builds all the Hitchhiker wheels, was going to be there. Stacy got her Hitchhiker as a used floor model when we were at The Fiber Event in Greencastle, Indiana. She wanted a jumbo flyer and bobbin for it, but wasn’t sure if her wheel might need some retrofitting. She messaged Dave on Ravelry, and made arrangements to bring it to MDSW so he could look it over and retrofit it, if necessary. He checked out the wheel, pronounced it in good working order, and determined no retrofitting was needed. She bought her jumbo flyer and bobbin, then we hiked back to the car to leave the wheel there while we spent the rest of the day at the festival. Stacy and I both wanted to see the herding dog demonstration at 11:00, so we made our way to the corral at the far end of the fairgrounds, shopped the vendors all the way back there, and then got a seat on the bleachers. The woman commanding the dogs wore a microphone, but the speaker quality was poor and we could only hear a fraction of what she was saying. Still, it was fun to watch the dogs and sheep maneuver around the ring. The sheep clearly had their own ideas about what they wanted to be doing, and they were less than cooperative! The dogs managed to get the sheep to move the right way, in fits and starts. After 15 minutes or so, we decided to leave. 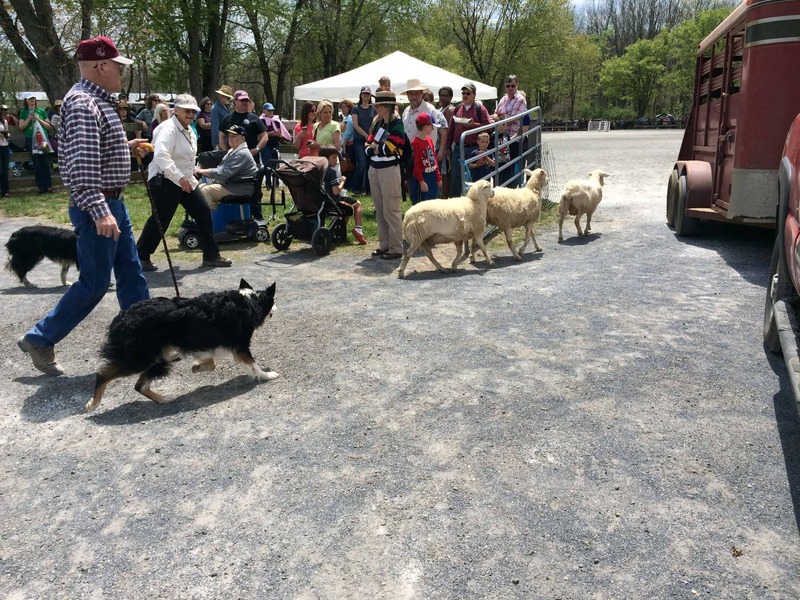 As we made our way around the edge of the corral, the sheep escaped from the ring by scooting underneath the fence! We found ourselves in the middle of the demonstration, as the sheep spread out around us, and the dogs followed them, trying to herd them back into the corral! 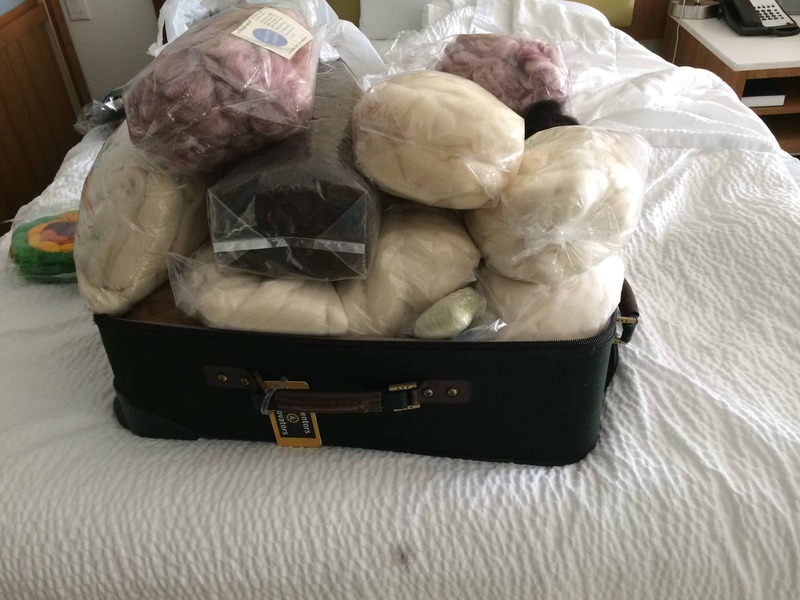 One of Stacy’s plans for MDSW was to buy her own fleece, and send it to be processed into roving. On Saturday afternoon, the three of us headed to the fleece barn on that mission. I forgot to take a picture of this, but along the right hand wall of the barn entrance hung a series of informational sheets about different breeds of sheep. 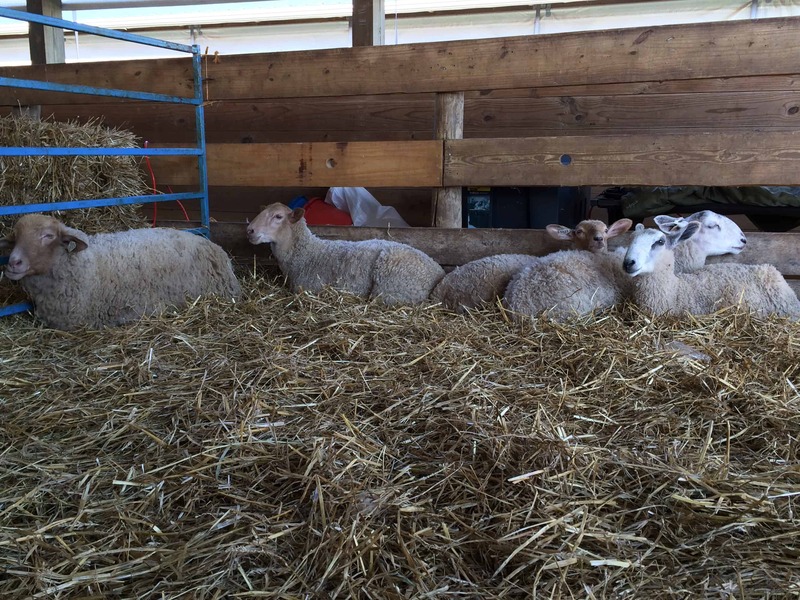 Attached to many of the sheets were samples of raw wool, processed wool, and spun yarn. Stacy was specifically looking for something that would be next-to-skin soft, so we petted the samples. Stacy decided she wanted a Gottland fleece. 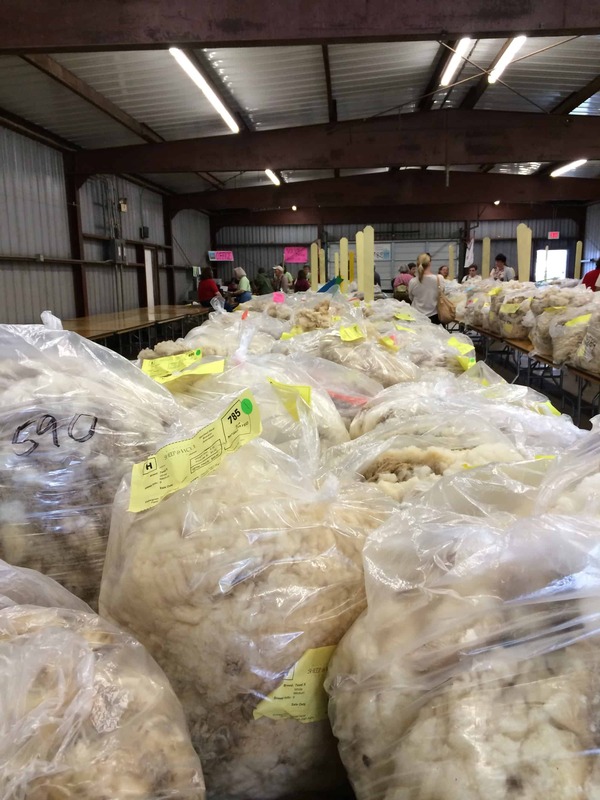 We were told that they only had 16 Gottland fleeces and that all had been sold already. That meant Stacy had to wander the barn, examining the options. 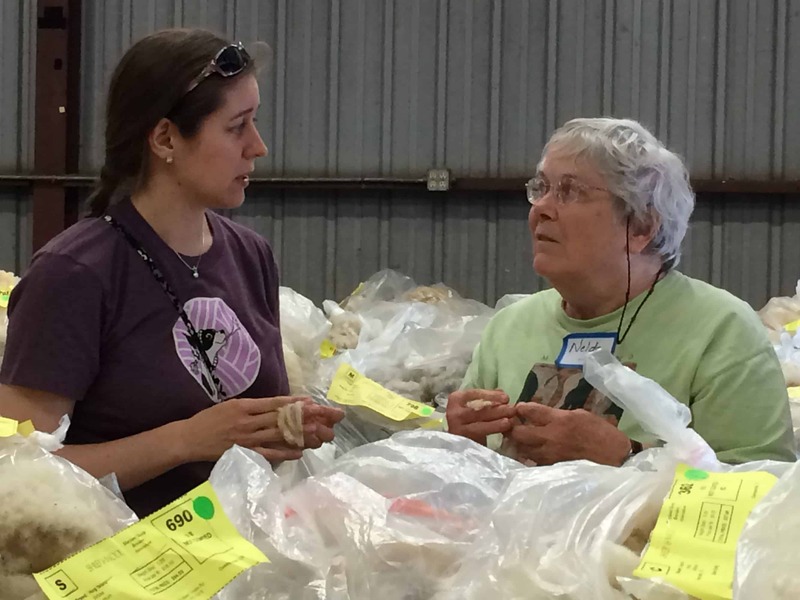 Fortunately, a helpful volunteer talked Stacy through the process, explaining what to look for in a fleece. 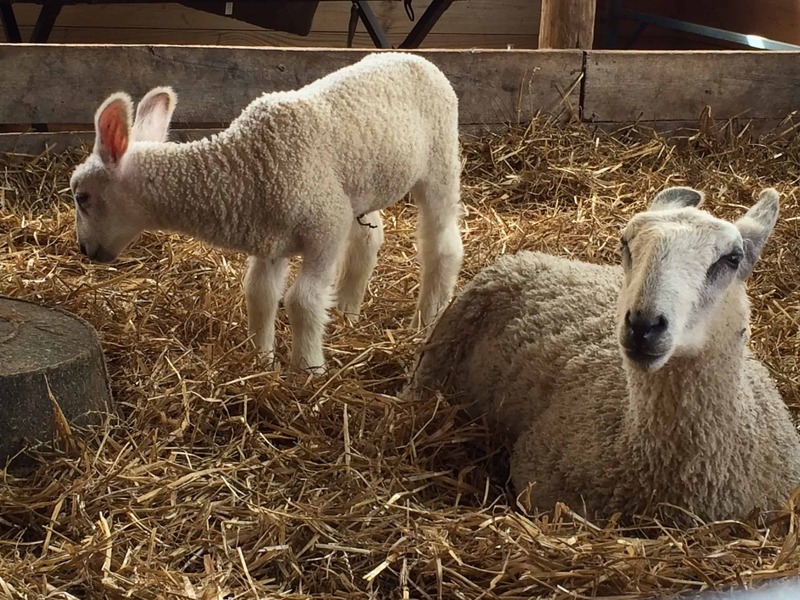 While Stacy was learning and I was snapping pictures, Beth wandered through the barn looking at the fleeces. Beth is a shopper. She actually shops for a living! Stacy almost had a fleece picked out, when Beth wandered over to me and said she had seen a Gottland fleece! I told her to go grab it off the table RIGHT NOW! It turned out to be a Gottland cross, not purebred Gottland, but it was the only Gottland fleece left in the building. Stacy bought it right away. The only problem with this fleece was that it was only 3.5 pounds. 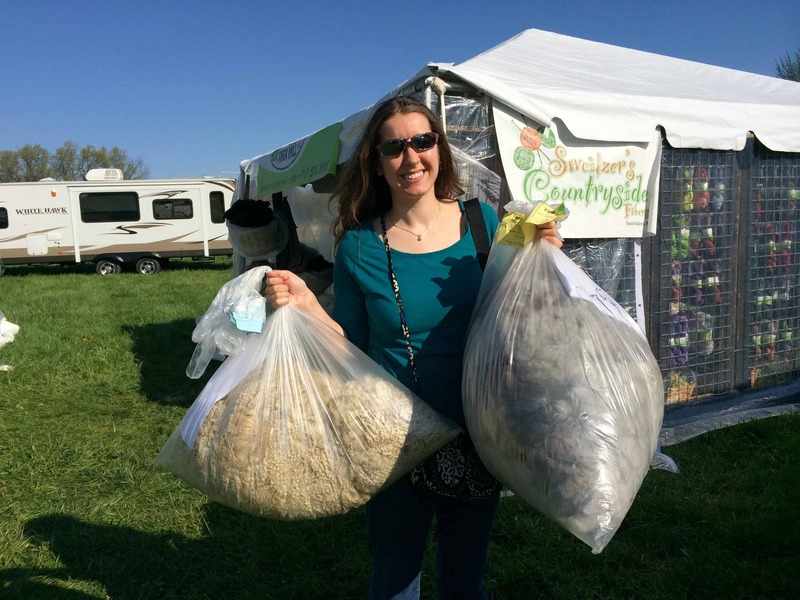 Stacy was planning to drop the fleece off with Sweitzers Fiber Mill for processing. When we were shopping the vendors near the herding dog corral, she stopped and picked up information from them. The minimum order is 5 pounds. 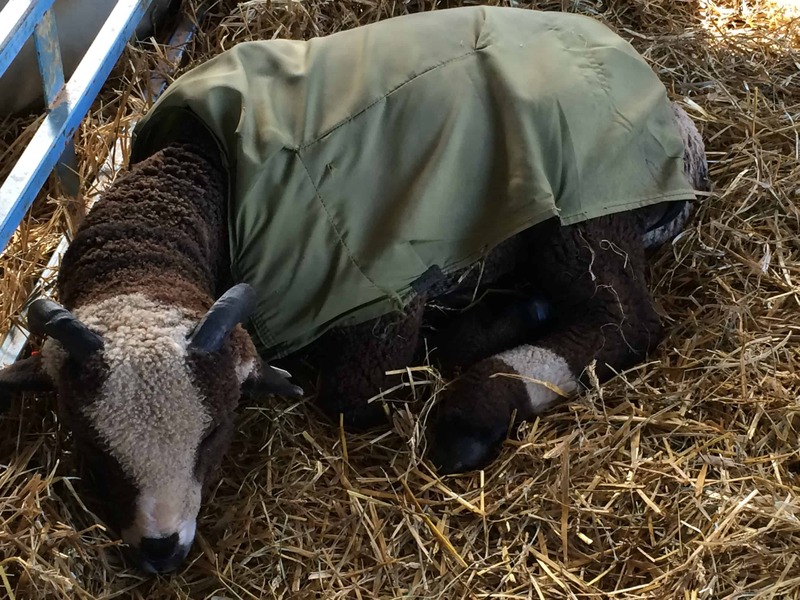 She thought and thought and finally, on Sunday morning, decided to buy a second fleece. We got to the fairgrounds around 8:15 am Sunday morning, and we were in the fleece barn shortly after they opened. 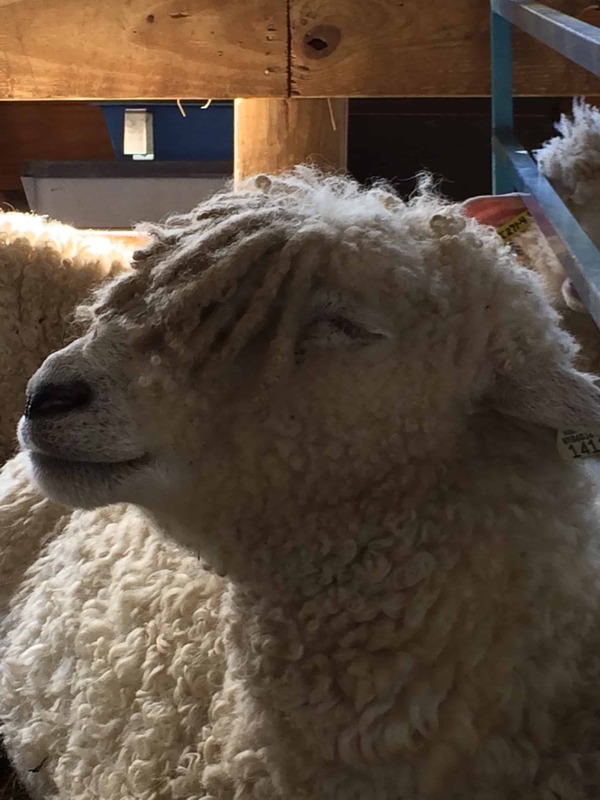 She found a 4 pound merino cross fleece and bought that. We headed straight down to Sweitzer’s and dropped off both fleeces. 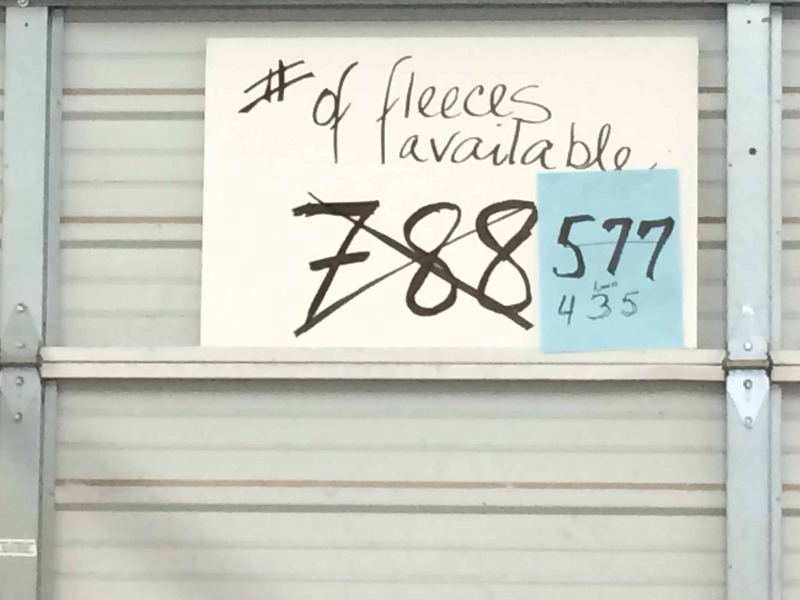 Hint: Even if you aren’t buying a fleece, you may find reason to head to the fleece barn. It is the only place I could find on the fairgrounds to charge my phone. Both sides of the barn have multiple 4-plug outlets! 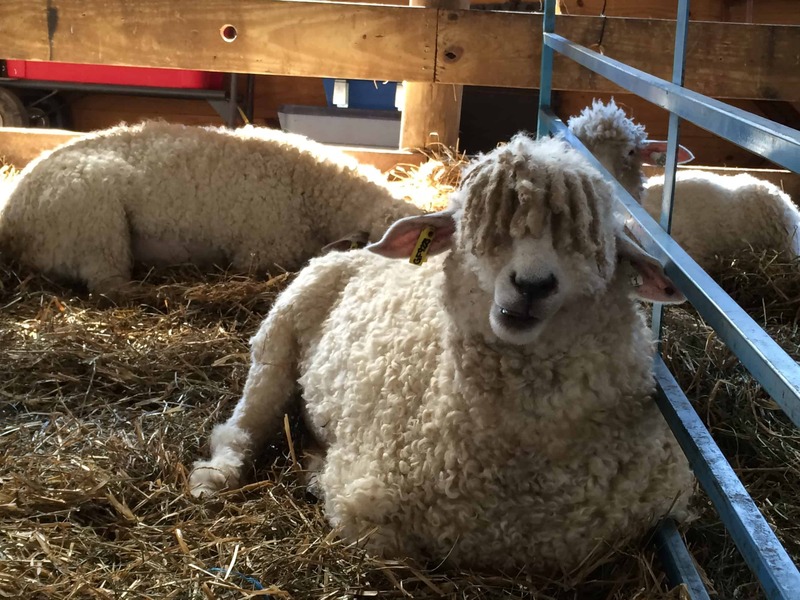 I neglected to take notes on breeds so, without commentary, I offer you a few of the sheep pictures I took at MDSW. We only saw two alpacas at MDSW. 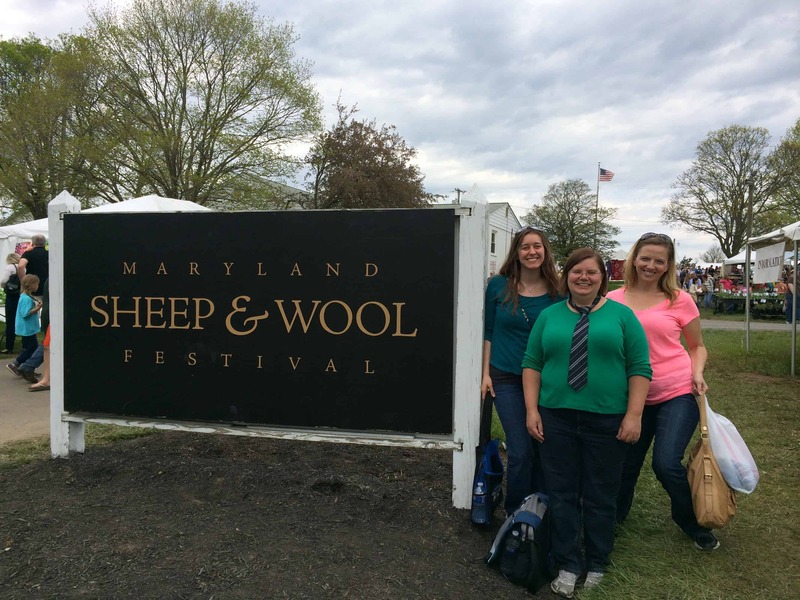 I saw an advertisement for a Maryland Alpaca Festival, held in the fall, so perhaps the alpaca breeders only go to that festival. I felt really bad for the two we saw. It was late in the day on Saturday when we saw them. They were skittish and trying their best to get away from people and each other. It was hard, because the pen was small, and it wasn’t possible for the alpaca to be out of arms reach on all four sides. The white alpaca was making a keening noise in his throat the entire time we stood there. 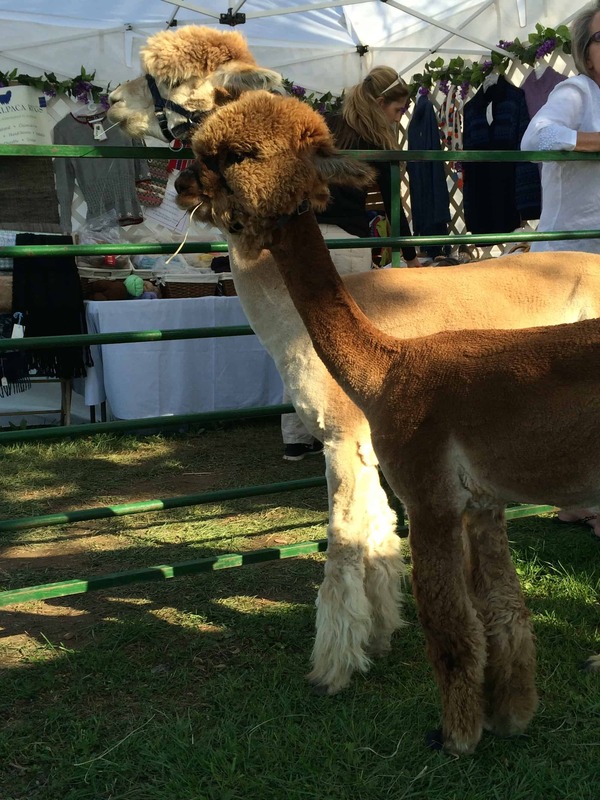 On Sunday, a different alpaca had taken his place. My sister’s friend Emily lives in the Washington, DC area and has been to MDSW for 7 or 8 years. She told us there was usually someone spinning straight from a bunny. This was something we wanted to see! On Saturday we went through the vendors in the area where Emily had seen the bunny-spinning in prior years. We saw a few rabbits for sale, but no one spinning from a rabbit. On Sunday morning, Stacy was chatting with a security guard when someone else came up and said the trash had not been emptied in the rabbit barn, gesturing in the general direction of the barn. On our way back to the car for our picnic lunch, we tracked down the rabbit barn. It was on the map, but a little awkward to get to it, and if you did not look at the map, it was unlikely that you would have accidentally wandered into it. 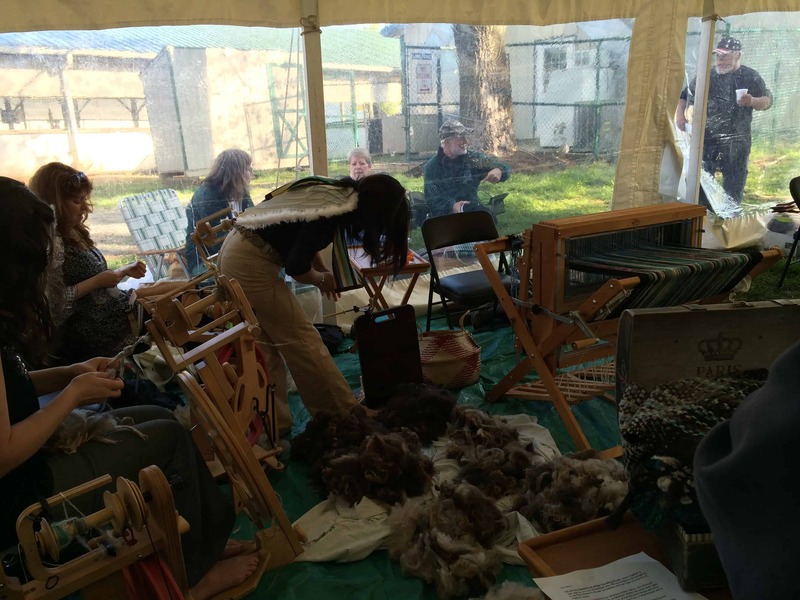 The barn held a number of fiber craft demonstrations, including someone spinning straight from a rabbit! I took a couple short videos of the demo and then made them into a single movie. At the beginning of the second half, it is a little hard to hear, but Beth asked the demonstrator, “Do the rabbits like the attention, or do you think they just tolerate it?” This is the question the demonstrator is answering. The rabbit spinning demos were not continuous. A schedule was posted, and each session lasted for about 1.5 hours, with at least that long of a break between demos. We arrived right at the end of a demo, and the rabbit went on break right after the end of the video you see here. The booth had several rabbits; I don’t know if the same rabbit was used for each demonstration. 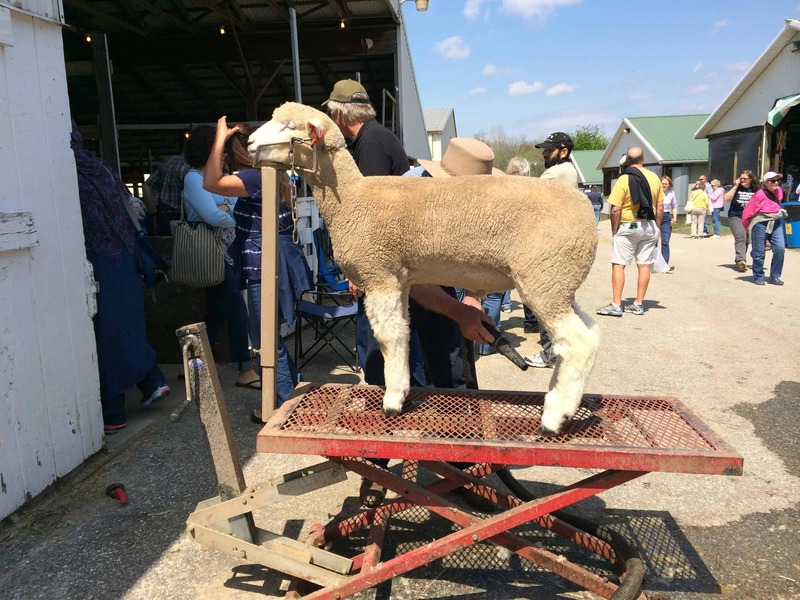 Sheep shearing demonstrations were scheduled on both Saturday and Sunday. I thought the shearer was a wonderful demonstrator. 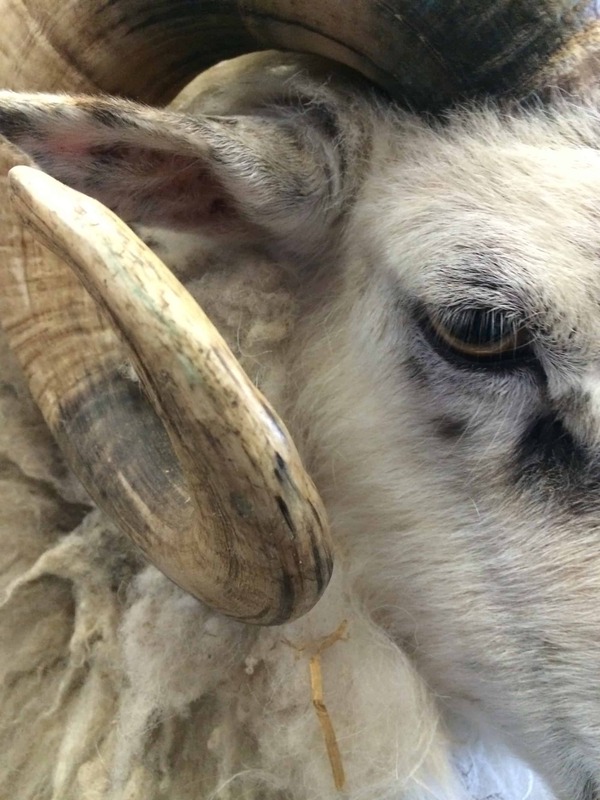 She has been shearing for 15 years, and is a full-time sheep shearer, traveling the world to follow the seasons. 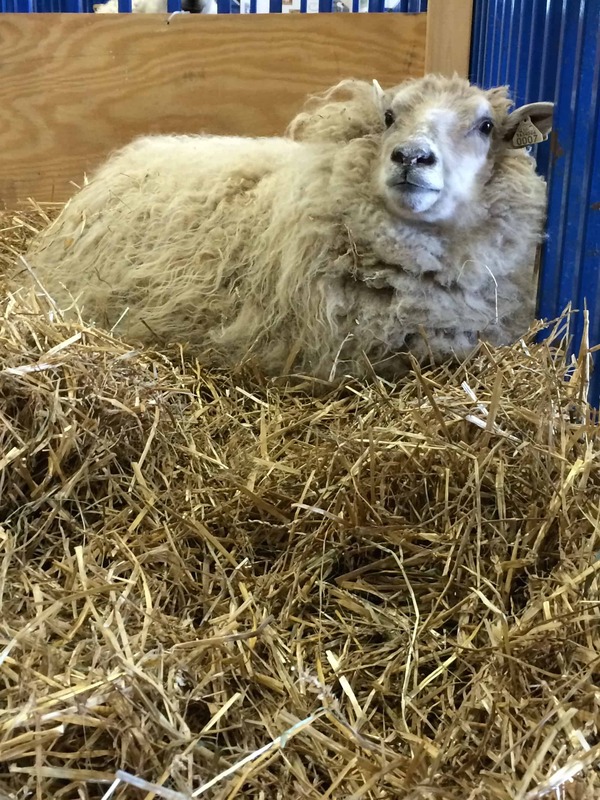 Her record is 235 sheep sheared in one day! 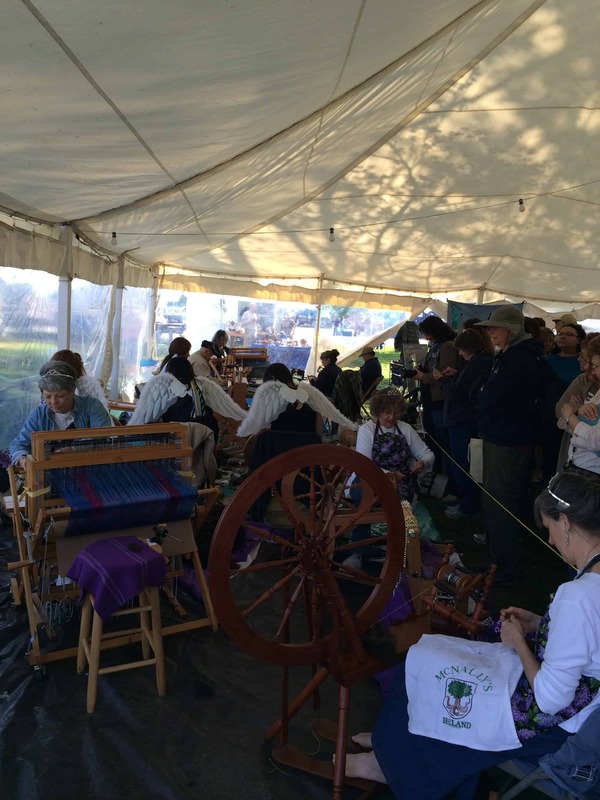 Sheep to Shawl is a competition that took place 8 am to 11 am on Sunday morning. 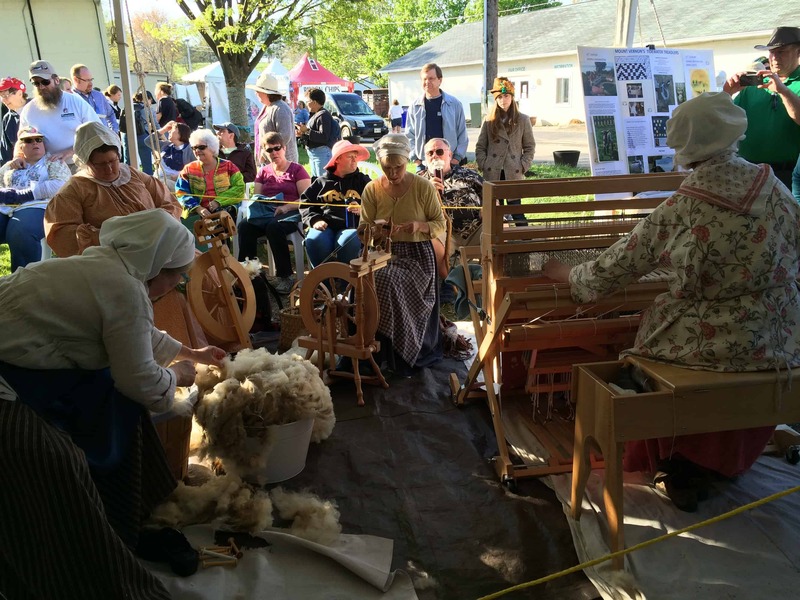 Teams consist of 5 members: 1 shearer, 3 spinners, and 1 weaver. 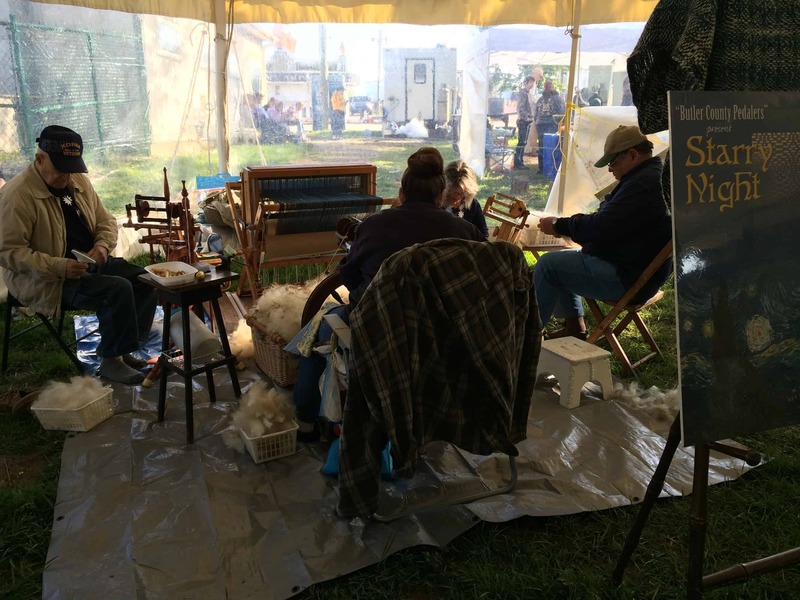 The shearer shears the team’s sheep, the spinners spin the fleece into yarn, and the weaver takes that yarn and weaves a shawl. Stacy and I arrived at 8:15, and the shearing was already finished. All the teams were spinning and weaving! We did come back later to check on progress, but we did not make it back at the end to see the finished shawls or to find out who won. On Sunday afternoon, the shawls were auctioned. Here’s pictures of several of the teams, hard at work! On both Saturday and Sunday, the Harry Potter Knitting / Crocheting House Cup held meet ups. Beth does not participate in the Cup, so she shopped on her own while Stacy and I hung out and chatted with fellow House Cuppers for an hour each day. On Saturday, about 40 people attended the meet up; on Sunday, about 20 people attended. Between the two days, I met a dozen fellow Ravenclaws! It is so fun to put faces to the names, though I was getting confused with real names after associating everyone with their Rav names! While chatting, I got some knitting done on the scarf I started on May 1st, which will eventually be turned into one of the HPKCHC classes this month. This is the part you were waiting for, right? And here I made you wait all the way to the end. Sorry about that, but it is worth the wait. I like to buy Christmas ornaments as a souvenir. That way, every year when I decorate the tree, I remember all those fun times, and talk about them. 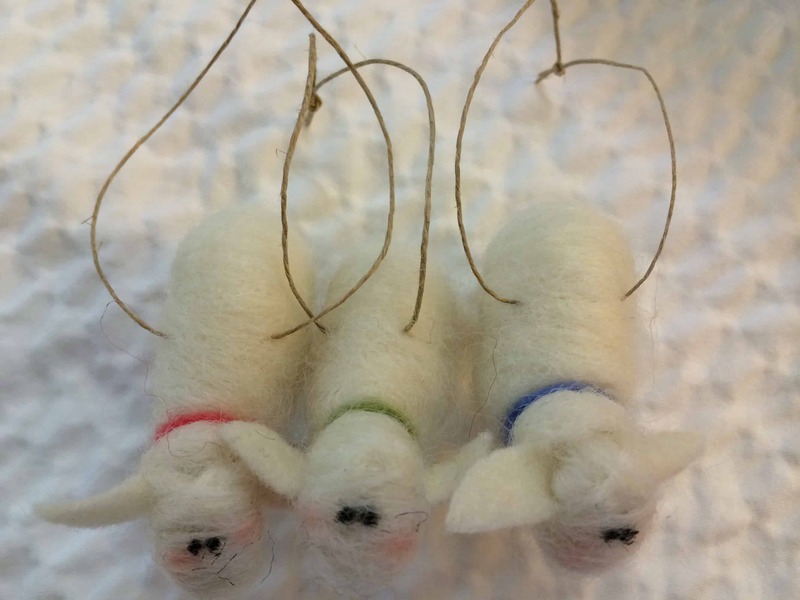 So I bought three felted sheep Christmas ornaments. 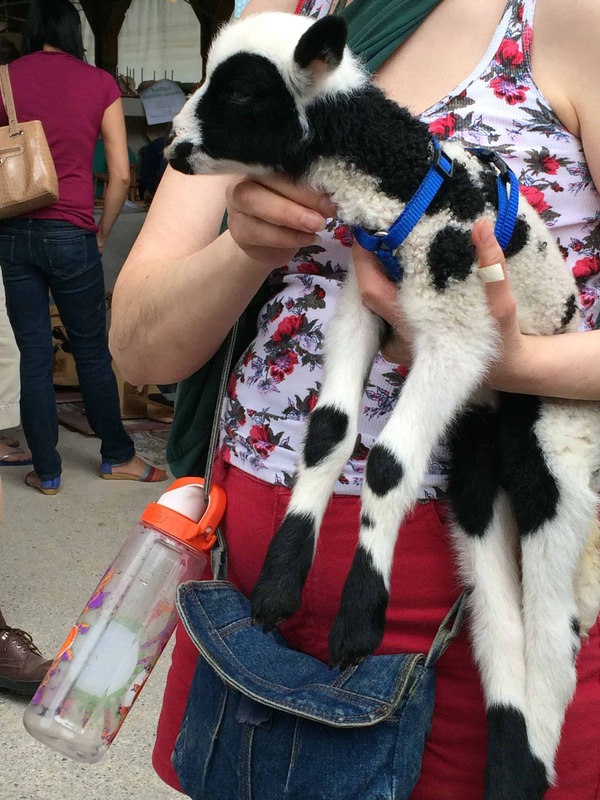 The green-collared sheep is mine; I gave the periwinkle to Stacy and the pink to Beth. My main shopping goal was to buy fiber. I have a ridiculous yarn stash, and am trying to reduce the size of the stash. But since I’m a brand new spinner, I have almost no fiber. 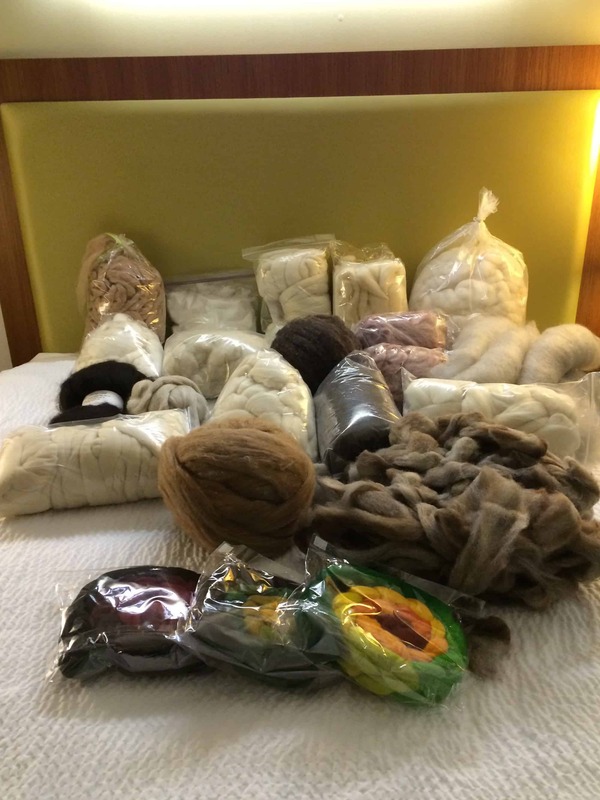 I did not have a specific list of fiber to buy, but I knew I wanted to try a variety of fibers. 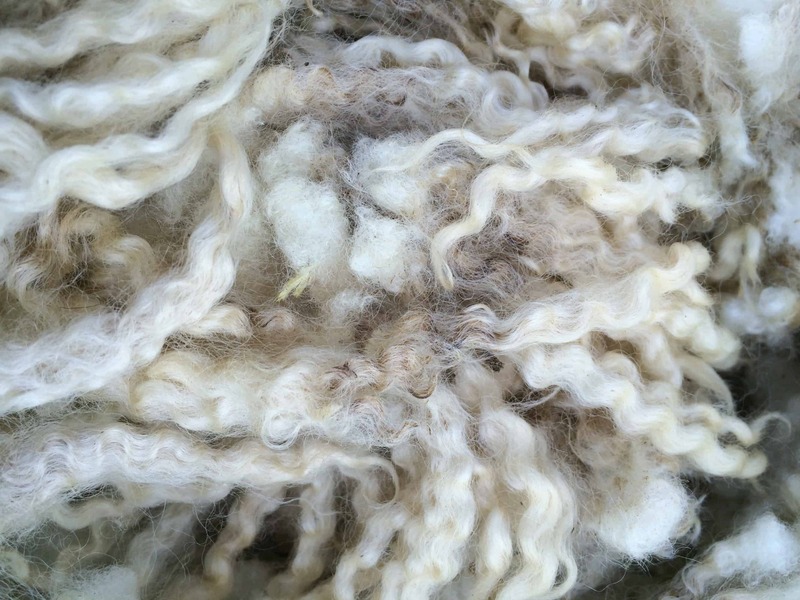 As we shopped, I found myself attracted to undyed breed-specific fibers. I was excited about these purchases. I am lucky enough to live close to a 1/2 dozen or so good local yarn stores, so I can easily get commercial yarns, so I didn’t want to buy those. I can also easily buy dyed fibers online from any number of wonderful dyers. 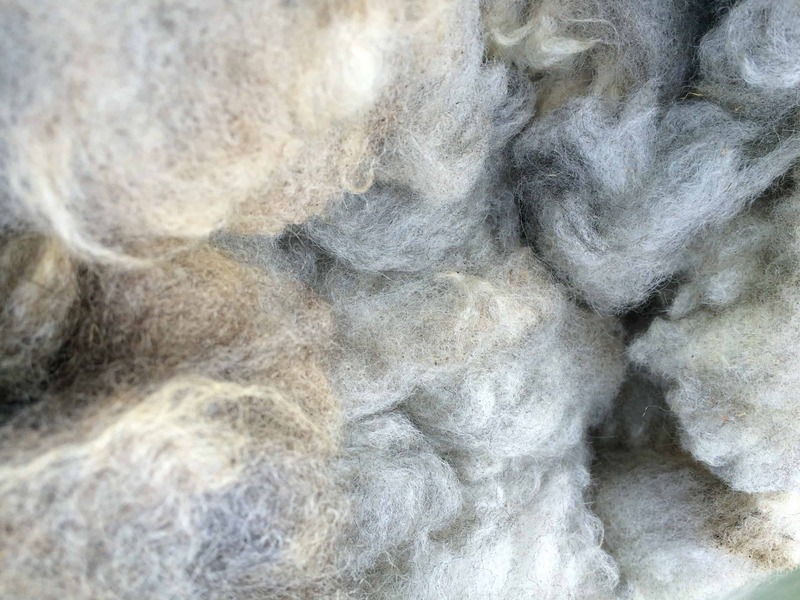 But until MDSW, I did not know of any sources of natural, breed-specific fibers. 4th row, l to r: Wensleydale, Fine Wool/llama/silk/bamboo, wool mill ends. It’s a good thing fiber is fluffy. I was able to zip the suitcase with no problem at all. At the airport, it weighed in at 26 pounds! I haven’t tried opening it yet. I expect it to be like one of those snakes in a can gags, with fiber popping up all over. I might video tape the suitcase opening in case it comes out as hilariously as I expect. We were there until the festival closed both days. We all flew home on Monday. No one’s flight was delayed. It was a perfect birthday gift. We had a wonderful time at the festival, and together. We have decided this can not be the only time we do something like this, and are plotting a trip to Rhinebeck in October. If it happens, you can bet I’ll write about it here! 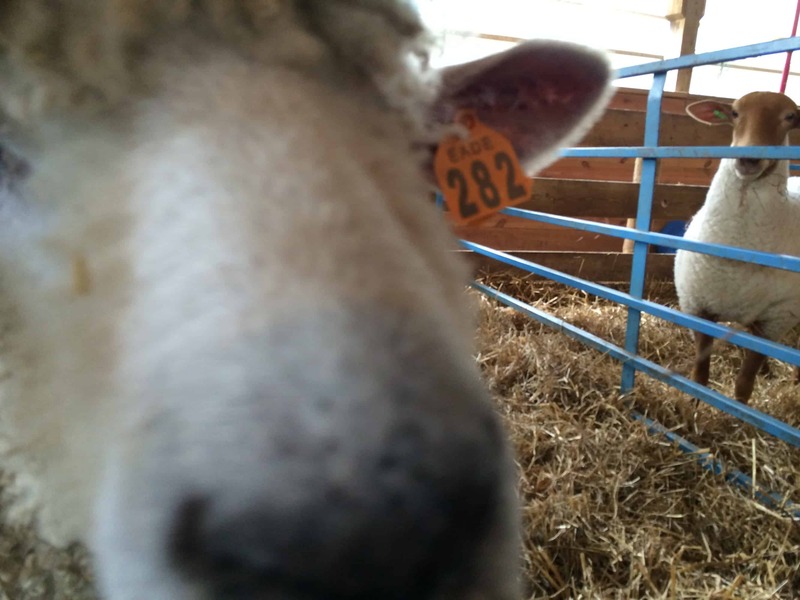 Love the detail of your blog, particularly enjoyed the sheep shearing video. Glad you had a great time! The suitcase! Hilarious, and universal.